1. For every item that is a good holiday gift, say so. - When people use Google for holiday gift shopping they are usually looking for ideas. Everyone has a person in their family that is hard to find gifts for; many people use Google to get ideas for a certain type of person. Searches like "Christmas gift for him," or "girlfriend Christmas gifts" were all very popular even in months like August. - People use search engines to ask questions. That is why you need to give them answers. If you have a gift that is perfect for a man who likes the outdoors, say that in the description. Put that kind of information in your tags, if you have room you can even put it in the title. 2. If you are going to offer a free shipping deal, let people know. - Free shipping is a great incentive for online gift shoppers as it takes a lot of the pain out of shopping online. If you are going to offer a free shipping deal, let people know in the promotion section so that "free shipping" appears on each item that ships for free. The term "free shipping" was included in over 3,000,000 searches in August, if you look at the seasonal trends for last year that number triples in the 4th quarter. People include "free shipping" with their searches to find deals such as "free shipping shoes." So if you are going to offer that sale, let Google know so it can pass it along to searchers! - You should also use the Promo label for Free Shipping so that browsers on ArtFire can see the deal right from the category results page. Promo labels can be added individually on the edit item page as well as with the global product editor. 3. 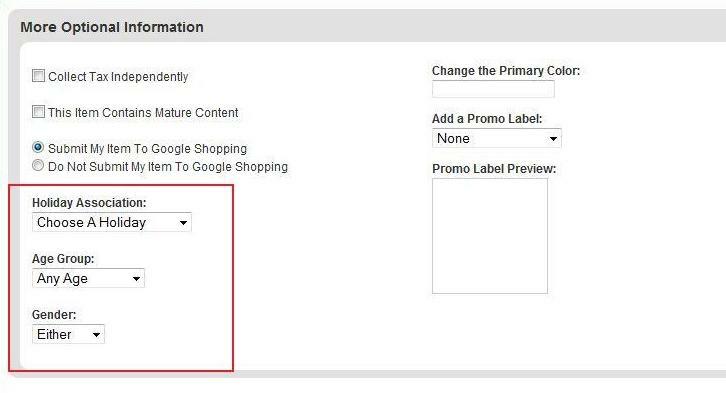 Make use of the Holiday Association, Age Group, and Gender selection options when listing a product. - If your item is suitable as a gift, list it in the appropriate Holiday association category. Make sure you chose the appropriate age group. Please note that 18+ does not mean a listing is mature, the "age group" language is intended to be within the guidelines of the CPSIA. Choosing the correct Holiday Association, Age Group, and Gender is a key factor to showing up in the proper holiday gift guides. 4. Start talking about gifts, gift ideas, and the holidays on your blogs/Twitter/Facebook page. - For major holidays, there tends to be a flood of "Gift Guides" that journalists roll out. It's a popular topic that people look for and read about. Why not give people what they want? Write a "Top Ten Christmas 2010 Gifts for Mom" list that features great gifts you find (and maybe a few you made). People look for ideas for gifts as much as they look at gifts. If you can write a blog post that gives people good advice, they might just take it! 5. If you plan on advertising, put a holiday theme on it.